In a large, heavy and extended casserole, or cast iron, high-sided skillet, heat about 1 1/2-inches of canola oil over medium heat until the oil temperature reaches 350 degrees (or test with a piece of tortilla or bread; it’s ready when the oil bubbles actively all around it). It will take awhile to heat, so get this started before making the dough. On a large plate, combine 1 cup sugar and 1 tablespoon ground cinnamon. Set aside. In a medium saucepan, combine the water, 1/4 cup oil, vanilla extract, 1/4 cup sugar, 1/2 teaspoon cinnamon and salt. Bring to a boil over medium-high heat. Add the flour all at once, turn off the heat and use a wooden spoon to stir vigorously until the mixture forms a dough as smooth as possible with no flour lumps. It will take about 2 minutes. Set aside to cool slightly. Transfer to a pastry bag fitted with a large star tip or a churro press. Pipe the dough into about 6 to 8-inch pieces (or if you want to replicate a churro store, pipe a rope-like dough of about 24-inches) and carefully place in oil. Fry for about 3 to 4 minutes, until golden and crisp, flipping in between. Use tongs to remove them and place on a paper towel lined baking sheet or drying rack. While the churros are still very hot, toss them in the sugar and cinnamon mixture to coat. If desired, serve with cajeta or dulce de leche as a dipping sauce and Mexican hot chocolate on the side. I watch your show every chance I get on PBS. They were showing a ‘Patti’s Mexican Table’ marathon last weekend on PBS and I was elated. I am presently watching you on PBS on a feature called ‘Women of Oaxaca’. I love how you incorporate your knowledge of Mexico’s Regional History into what you are cooking for a particular show. The incorporation of your family into the program is a plus for your program. I am Cajun French from Central Louisiana where cooking food is very much part of our culture. We spend as much time preparing the meat as we do cooking. I look forward to watching all of your shows including the re-runs. Thank you so much, Roger! I hope you continue to enjoy the show. I found your show on Amazon and watch it with my youngest daughter almost every night. We love watching! We have been trying your recipes every day for the last 2 weeks. You have ignited a passion for cooking in my kitchen. I love to eat Mexican food but I really love to cook Mexican food! 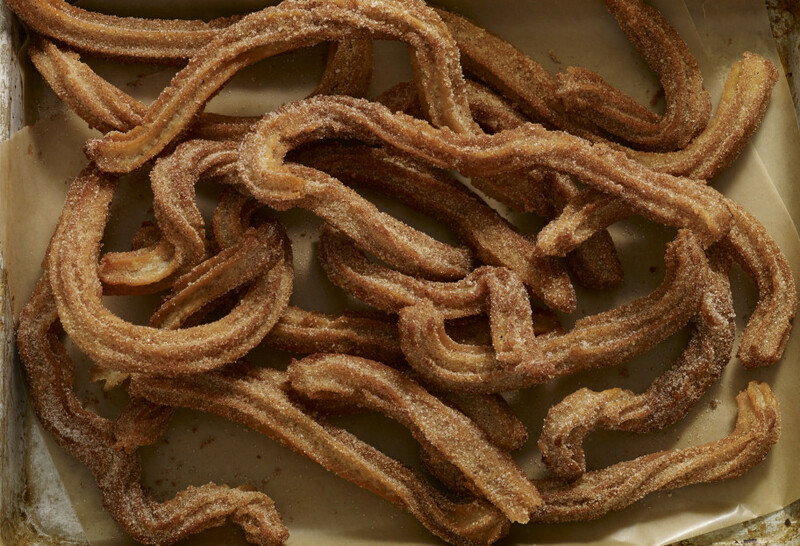 We made these churros this morning for breakfast. So delicious. Thank you for all of your wonderful recipes and for your terrific show. You are so fun to watch! Oh thank you so much Sarah! This made my day. Please say hello to your daughter for me! Hola, chef Pati … i always watch your shows and love trying your recipes especially this one. Churros tasted sooooo very gooood! Thank you for sharing it. I’m so glad you liked them, Laarni! Sweet Pati, I lived in Denver for twenty years and worked for a Spanish speaking doctor. Also went to a church where about 95% of my friends were from Texas. We were immersed in Hispanic culture. One of our favorite things to do was to cook together. Now that we live back in MI, we just cook our favorite recipes at home because they taste better than the restaurants, thanks to my Hispanic friends teaching. I love getting new ideas from your show and my Familia and AmigaOS get the benefit. I give you the credit when it’s your recipe. So blessed by you! Thank you so much Georgette! I’m excited to share more new ideas with you in Season Six! I miss seeing you on Saturday morning here in Coos Bay Oregon. I am excited to see you on line. and wishing you & your beautiful family God’s blessings always !!! Just to let you know that I can sense your sweet spirit…May our Lord always keep you!!!!! Wow, Martha! Thank you so much for your kind words. Blessings to you!! ????Hola! Beautiful Pati! I’ve just watched my favorite episode of Pati’s Table. Of course, CHRROS❤️ & watching you cook with your first born Handsome Prince! He is Tall! So are we. I love cooking with my first born Prince…he is 6’6″ & isn’t it strange when it hits you out of the blue. Then you said,”Awww I got a hug when he was a little boy” & I know that exact feeling, i tell my son allways about how sweet he was to his Mommy when he was a little boy! I will watch, re-visit this episode when I am having a not so good day because it is the Best! Thank you for teaching me tortillas, tomato jam & all of your wonderful recipes & their culture. You are an Amazing teacher, lucky Boys of yours. Thank you for leaving the D.C. rat race & giving so much of your knowledgeable self. GRACIAS! GRACIAS! GRACIAS! Hola Pati! No sabia que era tan facil! Me encanta tu show! 🙂 Thanks a bunch! I love your cookware too! where can I find similar cookware? Thanks Diana! Pues algunas cosas que tengo ya están muy viejitas! Algunas vienen de México, algunas son de Le Creuset, algunas vienen de Tlaquepaque! Others want to know where to buy the churro press. I found one from the 50s at a yard sale some yrs ago, but I don’t use it, it actually doesn’t work that well. Instead, I use a pastry bag with a large star tip attached to the end, it creates ridges that crisp up and work perfectly. If you want to find a churro press, perhaps look on amazon.com…they have just about anything! Hola Paty no te he dado as gracias por mandarme la receta de la hamburgsa con choriso, ya las hice y me quedaron muy ricas, te agradesco el darme la recetas y te sigo felicitano por tu programa y tu familia que se nota que todos están orgullosos de sus raizes el mundo necesita mas gente como ustedes. Paty quiero pedirte si me puedes decir donde compraste tu churrera, con la que hiciste los churros con cajeta porque yo he buscado mucho aquí en El Paso Texas donde vivo y no he encontrado y encarge una por la computadora y estaba muy chica y frágil y se quebró. por favor te agradeceré mucho que me ayudes con eso quiero hacerles los churros a mi hija que le encantan,y por eso me gustaría saber donde puedo comprar esa maquinita para hacer esos churros que hiciste tan deliciosos. Gracias por todo y que sigas triunfando entodo lo que hagas, seguire viendo todos tus programas. Churros look delicious! I’d like to get your churro making tool your son Alan used when he helped you make churros with cajeta. Where can i find it? Thank you Pati! Love your show! Dear Patti. Watching you make Churros con Cajeta, which look really good. Where can you get the utincel for making them. The last message that I sent I called them “Crullers” . Thank you for your shows and look forward to seeing them. food you cook and have had great success. Thank You. Today I’m trying the Tomato Jam. Never heard of such a thing, but it looked good, so I’ll try it. Thank you very much. Let me know how you like it, Louise. Muchas gracias Patty por otra receta! La cajeta con churros es una muy buena combinacion!!!! Que bueno que te gusta!